Well, maybe that was a bit dramatic. My life hasn't changed that much really, but the unique smell and somewhat bitter taste of coffee is no longer aversive to me. To the contrary, I've come to pleasantly enjoy its energizing effect in small doses. And, because I like to understand what I'm putting in my body, I decided to explore coffee: its history, its neurological mechanism, and—what I'm sure everyone's dying to know—why it is so easy to become addicted and dependent on it. According to legend, the first cup of coffee came into being in a most magical way. A goat-herd named Kaldi glimpsed the energizing effects of the unique, bright red berries in his flock and took it upon himself to test it out. Such revitalization inspired Kaldi to take the berries to a Muslim holy man. Scared, the holy man tossed them into a fire. Roasted beans were separated from the embers, ground, and dissolved in hot water, creating—you guessed it—the world's first cup of coffee. Coffee beans are derived from several species of the Coffea shrub—most commonly C. canephora and C. arabica. These plants may grow up to 5 feet tall and produce beautiful glossy, dark green leaves. The leaves then ripen to yellow, red, and finally black. 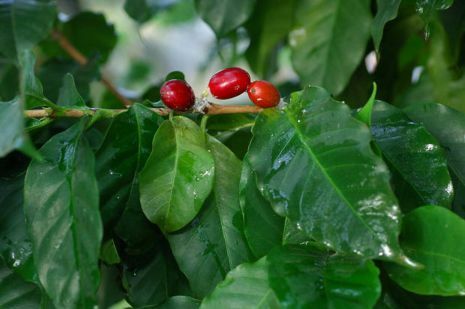 Coffea plants are native to Ethiopia, Sudan, and Kenya, and subsaharan Africa. Today, Brazil, Vietnam, Indonesia, and Colombia are the world leaders in coffee production, raising seedlings in nurseries before transferring them outdoors when they are between 6 and 12 months old. Each berry contains two seeds. 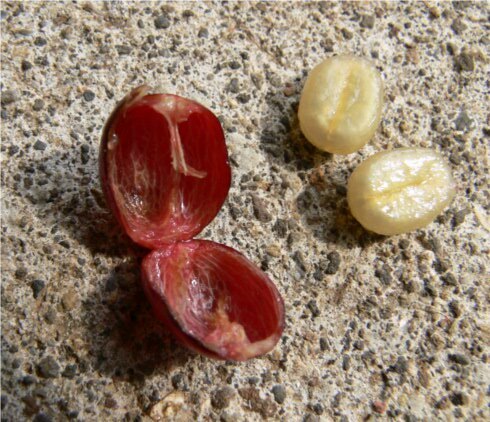 It may be surprising to you that these seeds are white. Only when roasted do we see—and smell—the recognizable coffee bean (what I thought were little balls of wood when I was younger). Roasting occurs when the internal temperature of the bean reaches 200º C (392º F), causing caramelization, or starch breakdown, which browns the simple sugars. Acids and oils within the bean weaken, creating its characteristic bitter flavor. Caffeol, one such oil, is generated at 200º C and is largely responsible for coffee's flavor. In the plant world, caffeine is a natural pesticide, protecting Coffea, tea plants, and other foods from certain insects. In the animal world, caffeine is a drug. A stimulant drug, to be precise. 1. Attached to a ribose sugar, it comprises one of the four constituents of the DNA backbone. 2. Attached to three phosphate groups, it exists as ATP, the energy currency of a living cell. In addition to these roles, adenosine also acts as an inhibitory neurotransmitter, believed to play a role in suppressing arousal, promoting sleep, and even inducing torpor in hibernating animals. Levels of adenosine increase throughout the day, which may explain why we become increasingly sleepier with each hour after awakening. Caffeine is unique because it is both water- and lipid-soluble, allowing it to pass the blood-brain barrier and enter the nervous system. 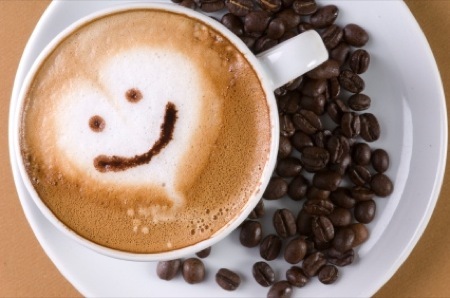 In the brain, caffeine works to counteract, or antagonize, the effect of adenosine. Because caffeine and adenosine have similar chemical structures, caffeine (below, red) can bind to adenosine receptors without activating them. In other words, caffeine is a competitive antagonist of adenosine. 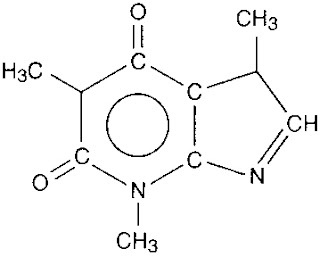 In this way, the sleep-inducing effect of adenosine (below, white) is blocked, promoting our lovely "coffee buzz." Caffeine has a half-life of ~5 hours, meaning that after 5 hours, half of the caffeine you ingested has been metabolized; after 10 hours, 1/4 of the caffeine is still there—hence potential for a sleepless night if consumed too late in the day. Caffeine addiction is not difficult to attain. In response to blocked adenosine receptors, the body will make more. In turn, your body requires more caffeine to block the additional adenosine receptors. 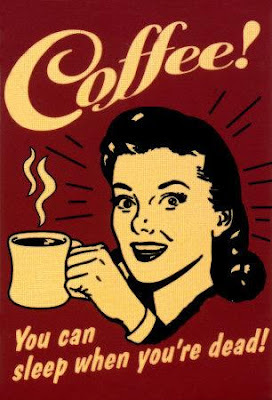 A person must drink more coffee, then, to obtain the same degree of wakefulness. Withdrawal symptoms include headache, irritability, difficulty concentrating, drowsiness, and pain in the stomach and joints. Keep in mind: while these symptoms appear within 12-24 hours of withdrawal, it should all be over after one to five days. Willpower is key! Coffee may make you lazy? A study published online Wednesday in Neuropsychopharmacology found that "worker" rats—those who naturally worked harder for reward—were more likely to avoid hard worker when treated with caffeine or amphetamine. Cocker and colleagues from the University of British Columbia created a rat cognitive effort task (rCET) which allowed rats to choose between an easy or hard task—rats who completed the hard task were doubly rewarded with sugar pellets. Those deemed "worker rats," when treated with caffeine or amphetamine, suddenly slacked off; conversely, "slacker rats" worked harder under amphetamine (but not cocaine). Grad student Jay Hosking interprets these results in terms of human needs. "For some of us, coffee really does the trick for those long hours in the middle of the day, but for other people it makes them too jittery or aroused to concentrate on their work." I could write so much more about coffee, including why it can be both good or bad for you in the long-term. I could also write about my favorite caffeinated beverage, green tea, and its incredible benefits, but I'll be lazy and leave it to these links. After all, it's past midnight, and my 7 AM cup 'o Joe has long since worn off.